Sergeant Epperson was the Sheriff's Deputy who first found Anastasia WitbolsFeugen's body at Lincoln Cemetery in the early hours of October 23, 1997. His testimony established where the cemetery is1 and an overview of its approaches and paths.2 He also helped establish where Anastasia's body was found,3 its position, and the nature of her fatal wound.4 Exhibits One through Seven were introduced. Exhibit One was a photograph of the body of Anastasia WitbolsFeugen, while Exhibits Two through Seven were aerial and ground photographs of Lincoln Cemetery. The State may go ahead and call their first witness.Sergeant, if you would come forward, sir. Good morning. Tell the jury your name, please. And how are you employed, sir? I'm a sergeant for the Jackson County Sheriff's Department. And on October 23, 1997, were you employed by the Jackson County Sheriff's Department then? What were your duties on that particular I guess very early morning? I was a deputy assigned to District Five, which is Blue Summit area of Jackson County. You know where Blue Summit is, and we may have jurors that don't know the Blue Sumniit area. Can you give us some major road type areas that they can get oriented in Kansas City to the Blue Summit area? Yes. It's bordered by I-435 on the west, 23rd on the south, Blue Ridge Boulevard on the east and Ninth Street in the north, and it's an unincorporated area that's between Independence and Kansas City. Is that why it's a patrol area for the Sheriff's Department? What were the hours of your shift that you were working at that time? I worked from midnight to eight. Did you consider yourself to be on routine patrol that evening? And in your patrol, did you have occasion to enter Lincoln Cemetery? Was that in the area that you patrolled routinely? Can you describe for the jurors what path you took just to drive into Lincoln Cemetery? I entered Lincoln Cemetery from Blue Ridge Boulevard going westbound on an access road and -- do you want to know another portion or another way that you can get in there? Well, we'll talk about Lincoln in just a little bit in more detail. 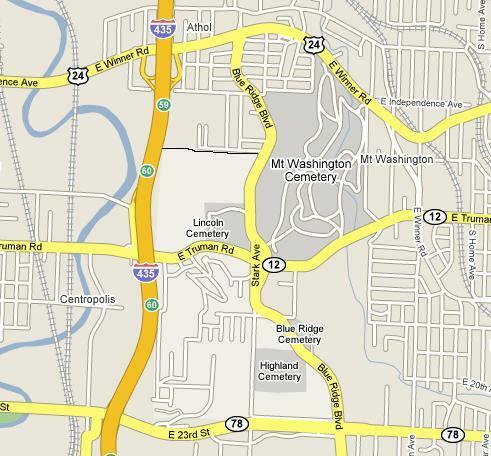 Lincoln Cemetery being in that area that you included in your patrol, is Mount Washington Cemetery in the area that you patrolled or next to it? Yes, it's directly across the street, across the street from Lincoln Cemetery, just east of Blue Ridge Boulevard. Do you know Mount Washington to have two entrances? Is one over on 24 Highway near a Dairy Queen? And is the second one on Truman Road? In terms of Mount Lincoln, there are two entrances there; is that correct? One is kind of a winding road off of Truman Road; is that correct? And the other entrance is? Blue Ridge Boulevard. Truman Road in that particular area does pass straight from, like, the Van Horn High School area directly to 435; is that correct? Now, in Lincoln Cemetery, if you could take the jury back to that particular evening and give a visual description of the cemetery as you first drive into it? At 3:44 in the morning, Lincoln Cemetery is very dark. It has no lights, no street lights. There is a lot of trees. And in October, there is lots of leaves on the trees. You can't see any roadways from inside Lincoln Cemetery. About the only thing you can see is lights of Kansas City off in the distance. Are there any gates into the Lincoln Cemetery? Would it be fair to say it's pitch black in there, because there is no lights in the cemetery? And there are no street lights that shine into Lincoln Cemetery, are there? Now, inside the cemetery, could you just describe the layout of the roads to include the little circle areas that are there. Okay. You've got one road, an access road, that comes from Blue Ridge Boulevard and goes westbound into Lincoln Cemetery and meets a circle drive. Actually, there are two circle drives there, one of them large and one of them a small one. The road veers southbound and winds down around past an old abandoned building and exits out onto Truman Road. Now, you said you entered the Lincoln Cemetery about 3:45. Fair to say you saw something unusual that night? About two-tenths of a mile west into Lincoln Cemetery on the access road, I observed a female laying on the ground. She was on her back. What was your first thought when you saw somebody laying on the ground on their back? The party could be injured. Could be intoxicated. Anything. But, obviously, it was unusual. What did you do when you saw that person laying on the ground? I notified dispatch that I had a person down in Lincoln Cemetery. Did you exit your vehicle? Yes. After I got a hold of the dispatcher, then I exited my vehicle, and I yelled for the person to get up. Did you receive any response from that individual? What did you do after you received no response? I approached the person and shined my flashlight into the person's face. What did you see when you shined your flashlight at the person's face? I observed that she had a large wound from the bottom portion of her nose down into her mouth area. I also observed a female who had her eyes open and a puddle of blood behind her head. After you made that observation, did you check for any vital signs? At that point I backed up. I wanted to make sure there wasn't anybody else in the area, and after I did that, then yes, I did approach her and tried to check for signs of life. Were there any signs of life? What signs of life did you check for? At first I looked to see if her chest or stomach was rising, because she was laying on her back with her arms above her head. And then I approached her, and I checked her wrist for a pulse, and she had none. I also noticed that her skin was cold to the touch, and her skin was also turning bluish gray color. From the location of the exact spot that you found this body, could you see traffic on Truman Road? Could you see traffic on Blue Ridge Boulevard? When you went back to your car and you obviously reported that you needed some assistance; is that correct? You waited for that assistance to come; is that right? Once members of your department started arriving, what task did you perform? Once the detective unit got there, and they got the crime scene sheets started and the perimeter roped off, they advised me to go ahead and secure a point on the perimeter up at Blue Ridge Road. So I guarded the perimeter, and I wrote my report. At the time that you were there, were you made aware of whether any identification was found on the victim? No. The detectives, they checked the victim's pockets, and I think all they found was a key chain is what I was told. So there was no identification found that night; is that correct? The following day, did you learn in the course of the investigation that the name of the victim, Anastasia WitbolsFeugen, had been at least determined? Your Honor, may I approach the witness for viewing some photographs? I want to show you some exhibits. Put them in order. I've got them marked as State's Exhibit numbers One, Two, Three, Four, Five, Six and Seven. Would you just look at these for a moment first? Do you recognize those photos? If you would put them here on the top. Referring specifically to Exhibit Number One, is this a photograph of the body that you found that night? Is it a fair and accurate representation of the body as you found it that evening? Your Honor, I move to admit Exhibit Number One. Exhibit One shall be admitted into evidence. Now, Exhibit Numbers Two through Five, can you describe what those are photographs of? That's the area surrounding where I found the body. Are they fair and accurate representations of the area in that particular time frame? Your Honor, I move to admit Exhibits Two through Five. Two through Five shall be admitted. Exhibit Numbers Six and Seven, these are not aerial photographs, but are these photographs of the Lincoln Cemetery of the area of where you located the body? Are they fair and accurate representations of that area as you recall it back on October 23, 1997? Your Honor, I move to introduce Exhibit Numbers Six and Seven. Exhibits Six and Seven shall be admitted. Your Honor, if I could have the witness stand maybe down here before the jury and try to show the photographs. You may do so. Members of the jury, during the course of this testimony, if you want to stand up to reposition yourself to look at what's going on, you're welcome to do that. Obviously, Mr. Lance, you can get up and go where you need to go also. This first photograph, Exhibit Number One, Your Honor, if I could let the jury know that at a point in time we'll pass these photographs as well to the jurors. Exhibit Number One is what? That's a picture of the dead body I found in Lincoln Cemetery. That photograph was taken before she was moved in any way; is that correct? And I would like to then refer to Exhibit Number Two, and Exhibit Number Two, if you could for the jury, I would like you to use my pen and kind of identify particular roads that they may use to get oriented towards this photograph. Okay. This road right here is 435 going north and south. This road here is Truman Road, this being east and this going west into Kansas City. This road back here is going to be Blue Ridge Boulevard as it crosses Truman Road, and this small access road here is actually starting. In this particular photograph, where is the area of where Lincoln Cemetery is found? Lincoln Cemetery is going to be right here, and it's going to encompass this area right here. Now, this road right down here from Truman Road that goes up a dirt road and a little bit of winding road, is that the road you were referring to that you took from Truman Road to enter Lincoln Cemetery? Actually, I entered from Blue Ridge and this is the access road into the Truman portion. Now, our photograph doesn't have that entrance from Blue Ridge at this particular one; right? But this winding road right here is the Trmnan Road entrance into Lincoln; is that correct? I want to refer to Exhibit Number Three, and if you would, just orient the jurors again one more time. It's fairly repetitive. Okay. This is going to be Truman Road again, approaching 435, which is going north and south in this picture. This is the Truman Road access road that comes up, and it winds up through here. And the Lincoln Cemetery, the gravestone portions are actually going to be over in this area. I'm referring to Exhibit Number Four, and could you describe what that particular area is that's depicted in that photograph? This is going to be -- this is the access road coming west from Blue Ridge. Blue Ridge is going to be back to the east. Right here is where I found the body. This is the circular drive that I was talking about earlier, and this is the small circular drive in front. It comes out through here, and it enters Truman Road coming back down the winding road. And Exhibit Number Five, is that the same particular circular drive with a little more of the northern portion of Lincoln Cemetery in it? Yes, it is. This would be eastbound towards Blue Ridge, and this is the small circle drive with the big circle drive; and this access road here actually comes out onto Truman. I want to look at a little detail around here. Looks like these little small speck in the cleared area. Do you know what those are? The small specks would be -- actually be the grave markers. Those are all set in the ground; is that correct? And again, for the jurors, the location that you found the body so they can be a little oriented in this photograph. I'll have you stand in front of those jurors. I'm sorry. It would be right back here on the picture. And Exhibit Number Six is a ground-level photo. Can you tell the jurors what angle somebody taking this photograph would be looking? They would be looking to the southwest. This actually it's going to be westbound from Blue Ridge, and this road here, the way it winds off to this side, is the one that comes out to the Truman Road access road. And then you get a ground level view of the circular drive and this small one here. Now, this would have been taken in the route that you were driving into the cemetery; is that correct? Could you on this photograph indicate for the jurors the location of the body? It was approximately right here, in this area right here. And lastly, the last photograph, referring to Exhibit Number Seven, this is a close-up photograph of what? Where the head was or where the victim's head was laying as it pertains to where the road was. Just down this way, that access road. Thank you very much. In my haste to get started, did I ask you your name for the record? Did you get the spelling down? All right. The area that you have indicated here, it is located in Jackson County, Missouri, where the victim's body was found; is that correct? Mr. Lance, do you wish inquiry? Mr. Epperson, from your preliminary observations of the murder scene, can you determine if this act was committed by a stranger or an acquaintance of the victim?